GCBO has an ongoing research project investigating the status of the western Gulf population of American Oystercatcher (Haematopus palliatus palliatus), a migratory species of high concern in the U.S. Shorebird Conservation Plan. Although much was known about the life history traits and threats to Atlantic Coast oystercatchers, little was known about the challenges faced by this species in the western Gulf until we began our investigation. 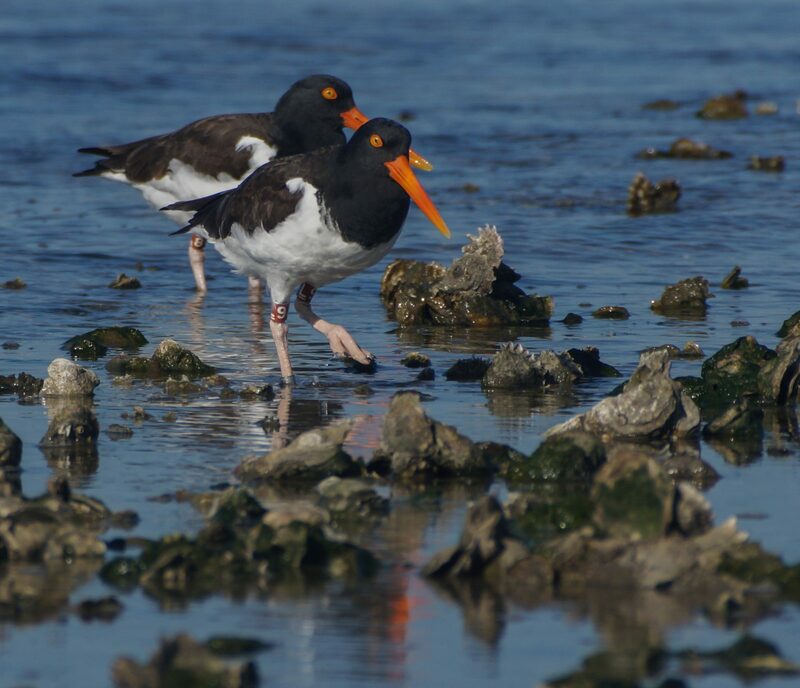 As a result of our work, we have gained much knowledge about the life history of Gulf Coast oystercatchers. Western Gulf oystercatchers prefer to nest on bay islands. They are subject to overwash, predation, and human disturbance. Because they nest on islands near or within Laughing Gull colonies, avian predation is a much greater threat than mammalian predation and pairs nesting on islands without large Laughing Gull colonies fare better than those on larger islands unless there is a significant weather event that causes nests on smaller islands to be overwashed. Human disturbance from recreational boaters and fisherman exacerbates the gull predation problem because it causes eggs and chicks to be without parental protection. The few pairs we have found nesting on the mainland or on islands that are connected to the mainland at low tide have been subjected to a number of predators other than Laughing Gulls including: coyote, opossum, and domestic cat. This project is coordinated by Dr. Susan Heath, GCBO avian conservation biologist. Dr. Heath has worked with three graduate students on this project to date and a synopsis of each of their results is below. We have color-banded over 350 oystercatchers in Texas and this is allowing us to learn much about their distribution. Adults are non-migratory though during the non-breeding season they wander to rich feeding areas along the coast. Oystercatchers do not breed until they are at least three years of age so the young birds spend about two and a half years after they leave their familial group wandering the coast. We have very little knowledge of where the young birds go at this point. Color banding is also giving us clues to how often birds switch mates, whether they are territorial year round, and whether reproductive success affects pairings. Public re-sighting of color bands is extremely important for this program. If you see a banded oystercatcher, please report it to Susan Heath. From 2011 to 2016, Texas oystercatchers were banded with two identical maroon color bands with a two character alphanumeric code in white above the leg joint and a single metal band on the lower right leg. In 2017 we began using three character alphanumeric codes in a triangle pattern because we ran out of two character codes that were not reverses of codes already used. Click here for a complete list of oystercatchers banded in Texas. Consider adopting an oystercatcher to support this project!